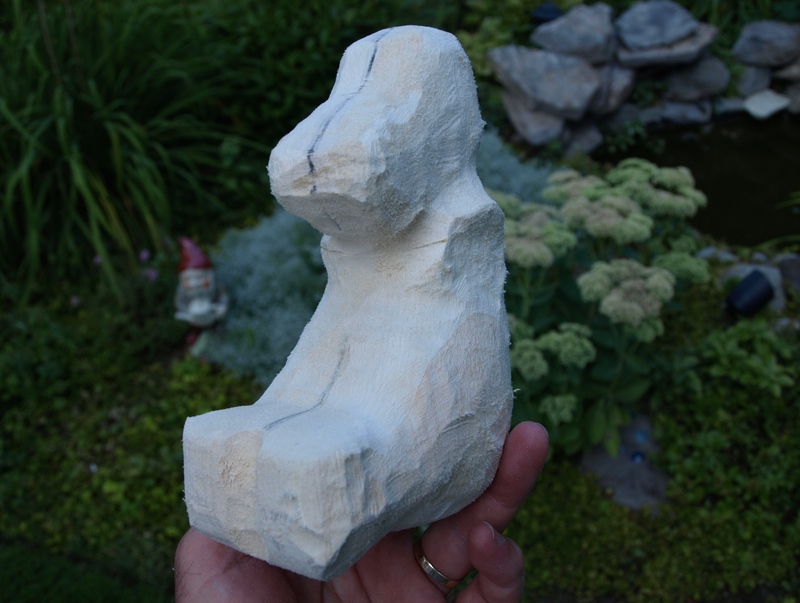 I’m using the clay sculpture now to rough in the Basset. Once again, I’m using a Typhoon bit and a Foredom tool to do the quick and rough work. I’m pretty much ready to start on the final shape and detailing with the knives and chisels. The arms turned out to be projecting out from the body more than I had initially expected and were necessarily long so that the newspaper that they’ll be holding will be at a reasonable distance from the hound’s nose. Given that, I decided to add the arms separately so that I could orient the grain of the wood along the arms for added strength. It doesn’t look like much now but it’ll take on a character soon enough. You can just see the small pond and surrounding rocks in this photo from my backyard. Our telephone company is installing fibre optics through the neighbourhood and is running into a lot of rock ( Kingston isn’t known as Limestone City for nothing ) as they dig. When Rosie and I go for our walks I end up carrying back a few good sized rocks that end up around the pond. I’m not sure that I’ll subscribe to the fibre optics but I’m at least getting something out of the construction phase of the work! Haha. Rosie and I lead a simple life!